It wouldn’t be a proper farewell to 2018 without reminiscing about some of the biggest UMBC stories from the year. The Retrievers made NCAA history, the Kennedy Center showcased a student’s critically-acclaimed choreography, UMBC was ranked one of the top universities in NASA funding…and so much more. Here are ten highlights from a year we won’t soon forget. CBS sportscaster Tracy Wolfson interviews (l-r) Coach Ryan Odom, Jourdan Grant, K.J. Maura ’18, and Jairus Lyles ’17, M.A. ’18, on camera after their NCAA victory. Photo by Mitchell Layton. Underdogs, who? 2018 will always be remembered as the year UMBC rewrote the record books. After the buzzer-beater heard ‘round the world to clinch the America East Championship, the Retrievers traveled to March Madness to take on the University of Virginia in the first round of NCAA tournament play. In what’s been heralded as the biggest upset in college sports, UMBC became the first No. 16 seed to overthrow a No. 1 seed in men’s NCAA history. 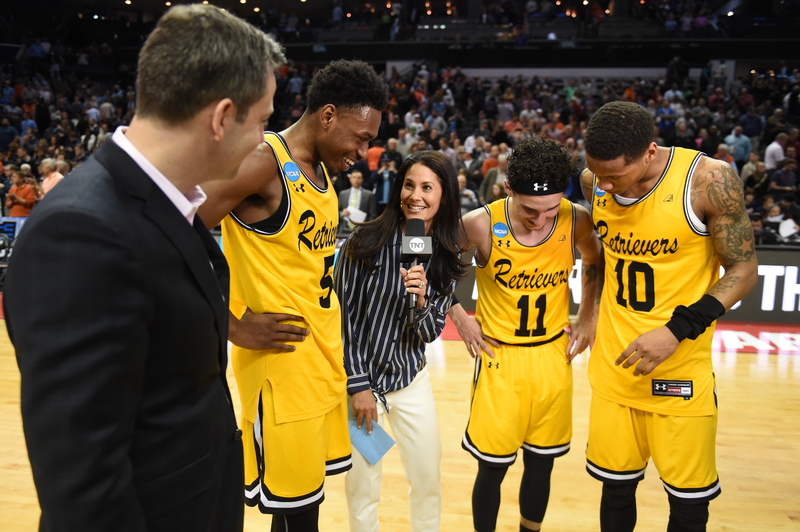 UMBC became “University of a Million Brackets Crushed,” and a flood of support poured in for the Retrievers. Everyone from Dan Rather to Steph Curry tweeted their congratulations, news outlets from around the globe picked up the story, and legions became new #RetrieverNation fans. Over the summer, the legendary upset was nominated for “Best Moment” at the ESPY Awards. The Retrievers didn’t walk away with a win, but they did walk the red carpet and got to meet some of their favorite athletes. 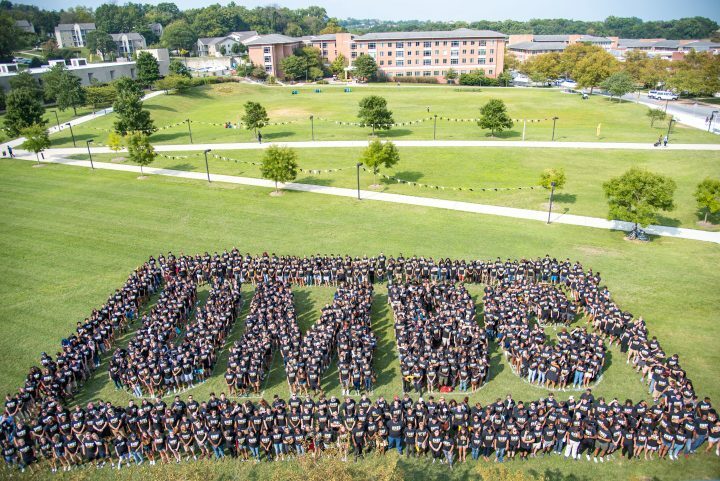 New UMBC students assemble for class photo. Photo by Poulomi Banerjee ’16 for UMBC. UMBC once again appeared on several distinguished rankings lists during 2018. U.S. News & World Report named UMBC one of the top ten national universities in both undergraduate teaching and innovation and one of the Best Global Universities. Numerous UMBC graduate programs earned U.S. News honors as well. The Center for World University Rankings declared UMBC one of the top 3.5 percent of universities worldwide. The Wall Street Journal and Times Higher Education also lauded UMBC as one of the top universities in the nation. The 30th annual Alumni Awards celebrated UMBC’s exceptional community of achievers. 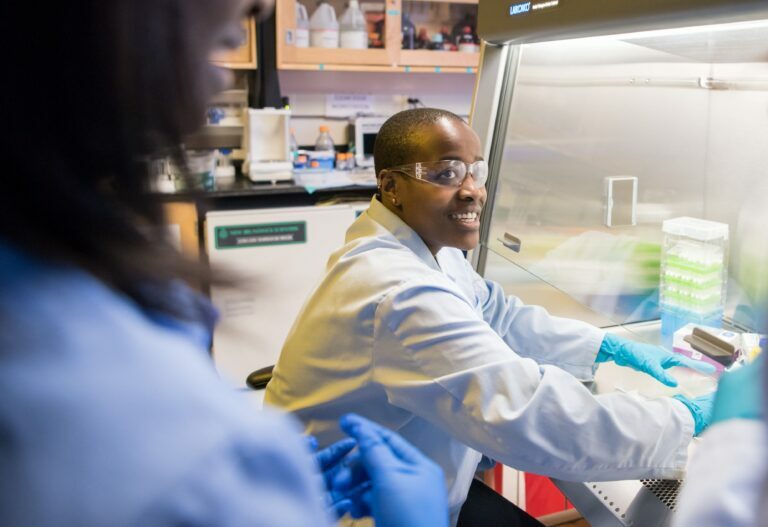 Naomi Mburu ’18, UMBC’s first Rhodes Scholar, works in the lab with a faculty mentor. 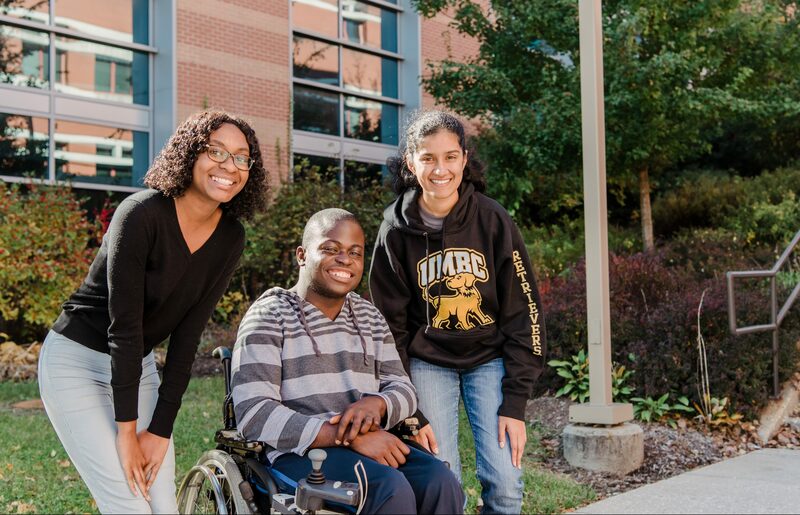 The Association of American Medical Colleges (AAMC) released new data that again highlighted UMBC as the top producer of African American undergraduates who go on to earn M.D.-Ph.D.s. 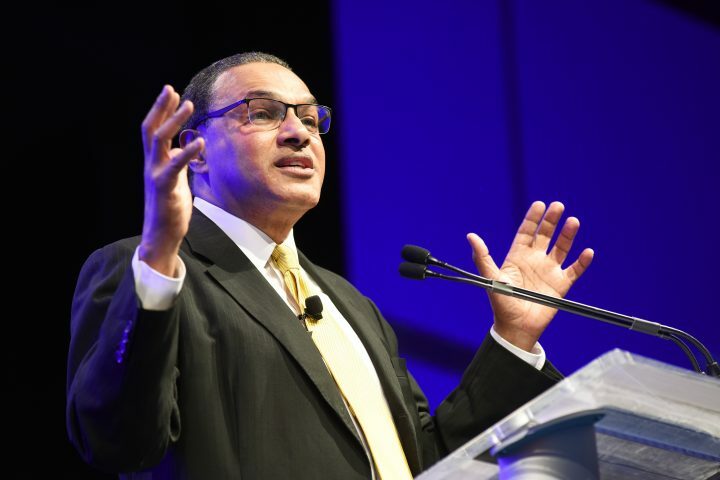 NSF also found that UMBC is the nation’s second top producer of African American undergraduates who go on to earn a Ph.D. across all STEM fields. This year, UMBC’s Meyerhoff Scholars Program will celebrate 30 years of commitment to diversity in the STEM fields. UMBC men’s basketball inaugural game in the Event Center. 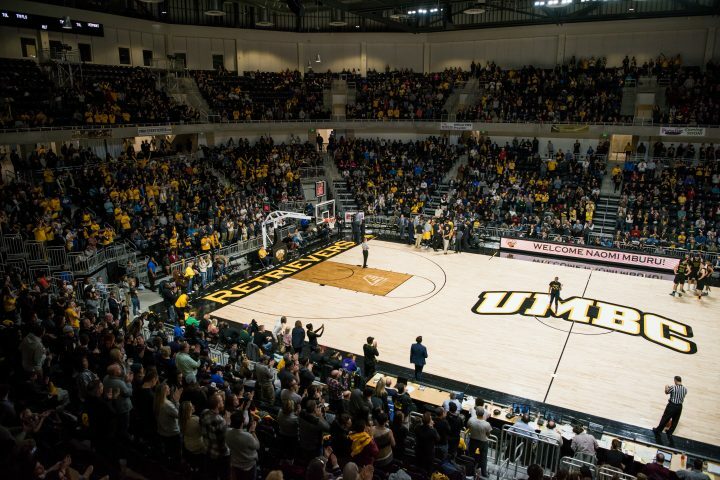 Retriever Nation found a new place to call home last February with the opening of UMBC’s Event Center. Men’s and women’s basketball and women’s volleyball have been enjoying the new 172,000-square foot facility. In addition to showcasing athletic matches, the nearly 6,000-seat venue serves as a community hub, welcoming musical performances and cultural events. Maia Schechter ’18, dance, shared her work at the American College Dance Association National Festival at the Kennedy Center in Washington, D.C. The Class of 2018 left an indelible mark on the history of UMBC. From the first Rhodes Scholar in school history, to record-shattering athletes, to critically-acclaimed choreographers, there was no shortage of grit and greatness from the graduates of 2018. With the support of the campus community and dedicated mentors, the Class of 2018 also produced eight Fulbright Scholars who have been traveling the globe. No matter what these graduates accomplish, they can always call UMBC home. 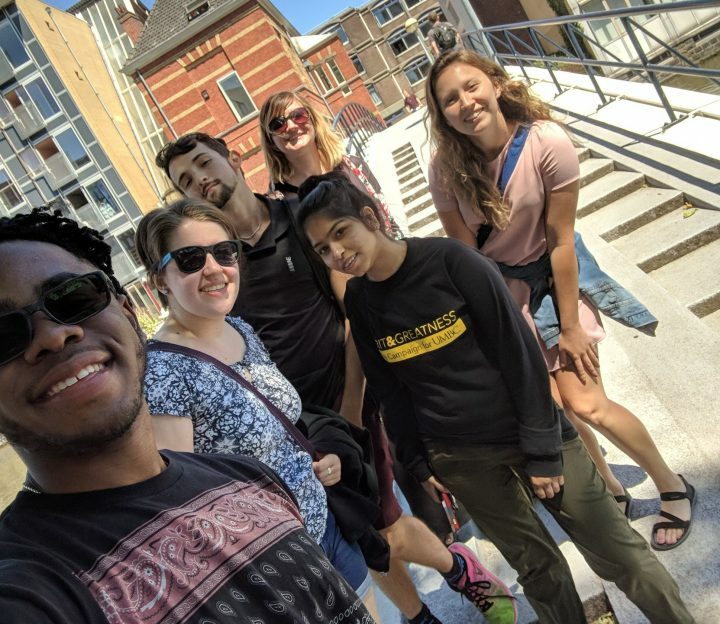 UMBC students exploring Amsterdam during a trip abroad. Photo courtesy of Mary Gallagher. UMBC is going global! This past spring, the Office of International Services hosted a Passport Caravan to provide students with resources to study abroad. To help students overcome the financial burden of securing a passport, this program also offered forty students fully-funded passport applications. UMBC students are taking advantage of all kinds of study abroad opportunities. This past summer, they shared their experiences on blogs and social media, as student ambassadors on faculty-led educational trips to Italy, Colombia, Spain, and the Netherlands. (l to r): Christine Mallinson, David Hoffman, and Romy Hübler. UMBC’s Center for Social Science Scholarship launched this fall, under the leadership of director Christine Mallinson, professor of language, literacy, and culture. The new research-focused center is the result of years of collaboration, planning, and dedication to consequential scholarship in the social sciences at UMBC. UMBC formally announced the new Center for Democracy and Civic Life in November, led by director David Hoffman, Ph.D. ’13, and assistant director Romy Hübler ’09, M.A. ’11, Ph.D. ’15. The center will help students develop knowledge, skills, and approaches for deep and effective community work, in collaboration with on- and off-campus partners. Jan Merka, GPHI director; T. Jane Turner, CSST director; and Belay Demoz, JCET director (l to r), all lead prominent UMBC research centers that work closely with NASA. The National Science Foundation included UMBC among the top 150 U.S. universities in federal research funding in its recent Higher Education Research and Development survey. UMBC continues to foster strong partnerships and ranks #12 in NASA funding across all U.S. universities. UMBC faculty pursue groundbreaking research that elevates the institution and makes an important impact on our world, across all disciplines. Recent examples include Jasmine Abrams, assistant professor of psychology, who received an NIH grant to reduce AIDS stigma in Haiti, and Nirmalya Roy, assistant professor of information systems, who received an NSF CAREER Award to advance smart home and wearable technologies. Niara Richards ‘22, left, Josh Mpere ‘19, and Nithya Prakash ‘22. UMBC students take capture-the-flag to a new level in cyberspace. In October, a team of students from UMBC’s College of Engineering and Information Technology tested their skills at the 2018 Maryland Cyber Challenge. After three rounds and hours of intense competition, the UMBC team was named winner. As a result, they earned the opportunity to complete summer internships to further their experience, and the University will receive new technologies to support UMBC students in developing their cybersecurity skills. To hear the latest UMBC news as it happens in 2019, follow UMBC on Facebook, Twitter, Instagram, Snapchat (@UMBClife), UMBC News, and the UMBC Magazine, and subscribe to the UMBC News “Top Stories of the Week” email. All photos courtesy of Marlayna Demond ’11 for UMBC unless otherwise noted.